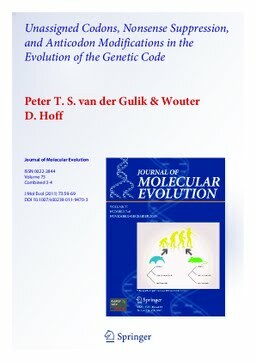 The origin of the genetic code is a central open problem regarding the early evolution of life. Here, we consider two undeveloped but important aspects of possible scenarios for the evolutionary pathway of the translation machinery: the role of unassigned codons in early stages of the code and the incorporation of tRNA anticodon modifications. As the first codons started to encode amino acids, the translation machinery likely was faced with a large number of unassigned codons. Current molecular scenarios for the evolution of the code usually assume the very rapid assignment of all codons before all 20 amino acids became encoded. We show that the phenomenon of nonsense suppression as observed in current organisms allows for a scenario in which many unassigned codons persisted throughout most of the evolutionary development of the code. In addition, we demonstrate that incorporation of anticodon modifications at a late stage is feasible. The wobble rules allow a set of 20 tRNAs fully lacking anticodon modifications to encode all 20 canonical amino acids. These observations have implications for the biochemical plausibility of early stages in the evolution of the genetic code predating tRNA anticodon modifications and allow for effective translation by a relatively small and simple early tRNA set. van der Gulik, P.T.S, & Hoff, W.D. (2011). Unassigned Codons, Nonsense Suppression, and Anticodon Modifications in the Evolution of the Genetic Code. Journal of Molecular Evolution, 73(combined 3-4), 59–69.